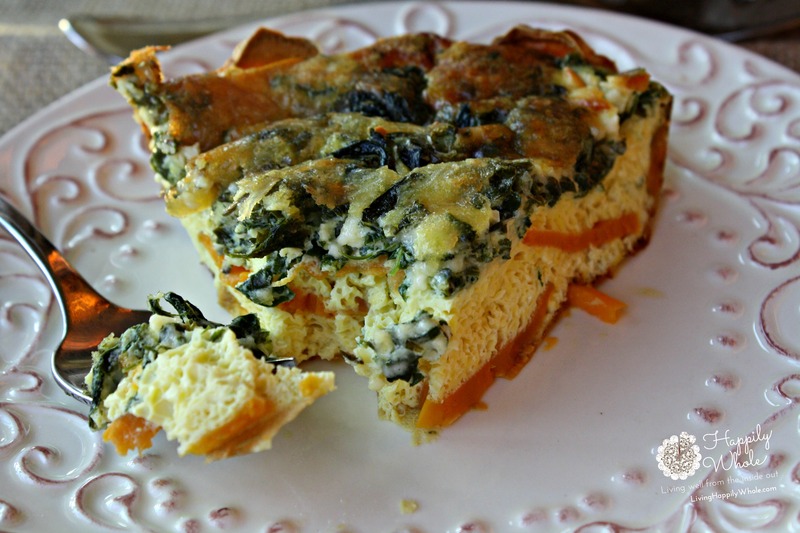 Organic eggs, fresh herbs, dark leafy greens and my all time favorite--the sweet potato! What is NOT to like in this crossover dish? A Personal Story incorporating sweet potatoes at the end! I've prepared this for breakfast, brunch and dinner. And I may or may not have polished the leftovers off cold from the fridge for an evening snack. 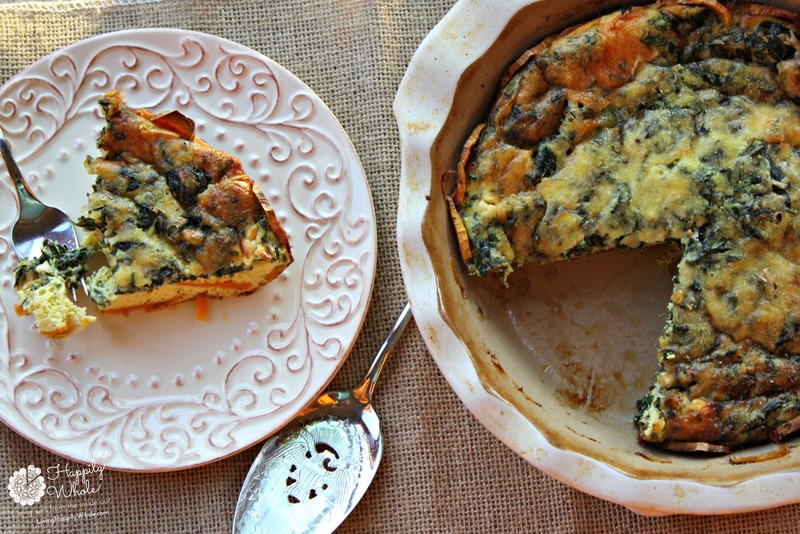 Whenever you eat this protein packed meal, it provides a grain-free filling delight! I served it with a sprouted grain English muffin half and some diced, roasted sweet potatoes. I roasted those right along with quiche while it was baking. A side of berries completed the plate both for flavor and nutrient profile. 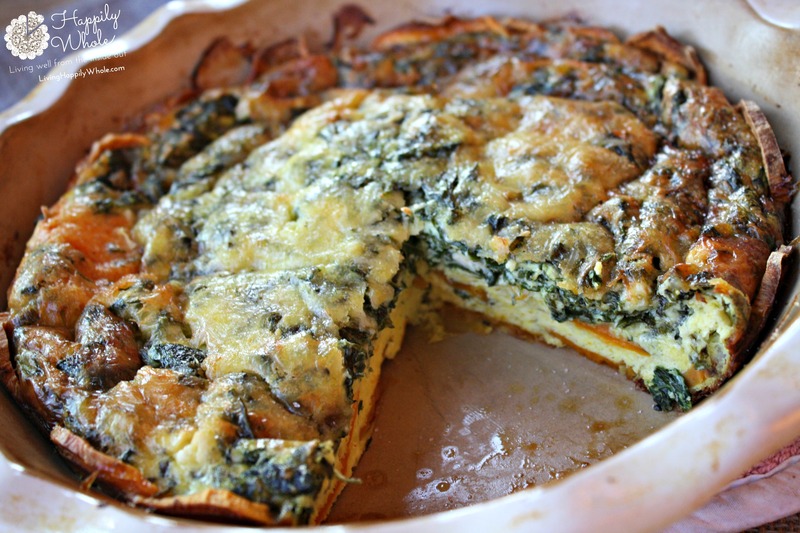 When I started the 30 Day Spring Cleaning Challenge, I made sure that all the ingredients in this quiche fit the Grocery Shopping List guidelines. That way, I could make it for brunch on Sunday and eat leftovers throughout the week. I'd also like to suggest baking the batter in a cupcake pan (using parchment paper cupcake wrappers). It takes the 'grab and go' breakfast to the next level! Peel sweet potatoes and slice them as thin as you can. Spray or butter the bottom of a deep pie plate. Line the sliced sweet potatoes on the bottom of the pan. Bake for about 15 minutes, until sweet potato slices can be pierced with a fork. Put olive oil into a saute pan and saute the garlic and onion for about 5 minutes. Add the spinach to the pan and cover, allowing the spinach to wilt and release water. Drain any access water from the pan. In a meduim bowl, whisk the eggs well. Add the cheddar cheese and herbs. Stir well. Add the mixture from the saute pan into the egg mixture and stir. Pour over the baked sweet potato slices in the pie plate. Sprinkle the asiago cheese on top. Bake at 375 for about 40 minutes, until solid in the middle. *Choose herbs to your taste. I used about a tablespoon of each. But here's where you can use your creativity.